Printed in italics, 14pp., folio (also [paginated in MS 133-146, extracted from a volume of Parliamentary Circulars with the ownership signature "Frederick Peel", Member of Parliament (from Feb. 1849), dated 1839-1851), very good condition. The context makes it plain that this Circular was sent to all Colonial Governors, a gap in the text indicating where the name of a specific Governor would appear in MS.
[ Daniel Frohman, American theatre produced. ] 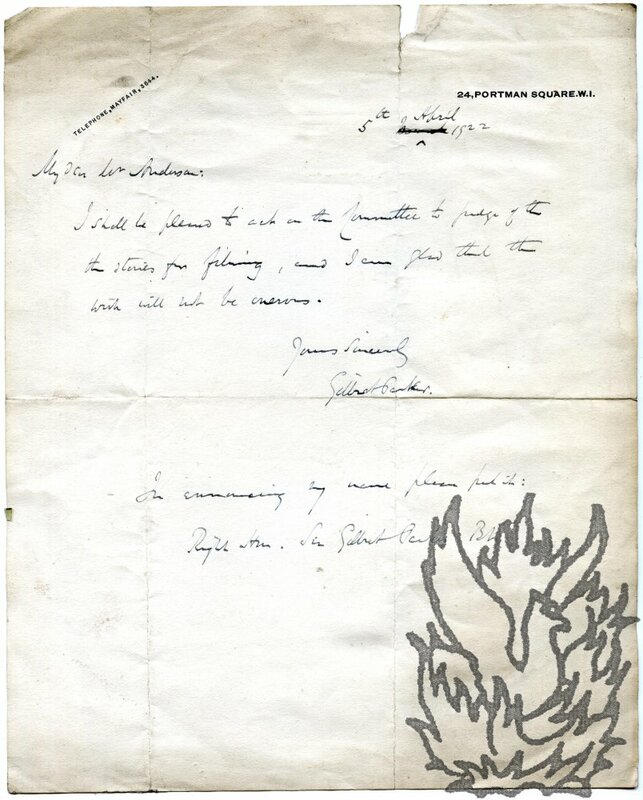 Autograph Letter Signed, inviting General Townshend to 'the Famous Playerrs Ball', where he will met 'some of our leading lights in the picture world', including Elsie Ferguson. On letterhead of the Lyceum Theatre, 43rd Street, New York. Undated, but circa 1921. 2pp., 12mo. On tinted paper. In fair condition, lightly aged and worn. 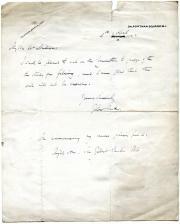 The letter begins: 'Dear Gen. Townshend | Won't you come with me to the Famous Players Ball on Wed. eve? | I am going to ask Miss Balfour. We can all dine here at my office at 7 on that eve - & have time to see later a litttle entertainment prior to the dancing.' He offers to present him to 'some of our leading lights in the picture world especially Elsie Ferguson who is now playng in Arnold Bennetts "Sacred & Profane Love' (which appeared in 1921). [ Percy Nash, English pioneering film director. ] Collection of miscellaneous material, from the Percy Nash papers, including typescripts of unpublished and unperformed plays, poetry collections, autobiographical account, correspondence. Most items undated, others from between 1923 and 1957. From London, Brighton and other locations. The material, from the Percy Nash papers, is in fair condition, with light signs of age and wear. It is arranged in the following description in ten sections. ONE: Two drafts of an autobiographical account by Nash, ending in 1933. Both 2pp., 4to. The first is headed 'Percy Nash' and the second 'PERCY NASH. born December 5th 1868'. Of interest are the following statements: 'Owing to indisposition of Harry Loveday, was engaged by Sir Henry Irving to Stage Manage (associated with Laurence) the production of "Robespierre" at the Lyceum Theatre, and remain with him for several years. [ Rudolph de Cordova and Alicia Ramsay, playwrights and actors. ] Typescripts of three plays: 'The Earthquake', 'The Hand of Vengeance' and 'A Game of Nap' (the last by de Cordova alone), and of a short stoy by de Cordova, 'The Man in Mourning'. 'The Earthquake' performed at the Hippodrome, London, around 1914. 'The Man in Mourning' published in the Green Book Magazine, February 1916. De Cordova was a voluminous author (see his entry in Who Was Who). Several of the couple's works were adapted for the cinema during the silent era. Of the four items present here, 'The Man in Mourning' was published in the Green Book Magazine, February 1916, and de Cordova's entry in Who's Who 1914 lists 'The Earthquake' among 'seven sensational dramas for the London Hippodrome'. No record has been found of the other two pieces. Four duplicated typescripts. In fair condition, with some wear and aging. ONE: '"The Earthquake" A Dramatic Sketch by Alicia Ramsey and Rudolph de Cordova'. A play. North American Films Corporation; George Munroe. Advance Prospectus, four pages, 4to, bifolium, fold marks, small closed tears along folds, sunned, minor staining, good condition. A detailed view of the state and potential of the Motiuon Picyure Industry is give (commercial, entertaining, educational, growth, attraction of stage stars, etc.) but apparently the invention of a fraudster. Signed black and white photograph by the Scottish silent movie star John Stuart, who starred in Alfred Hitchcock's first film (and another by the director), and in several Gainsborough Studios features. 'Photo by L. Protheroe.' Undated [1930s?]. Black and white studio photograph, postcard format (14 x 9 cm). 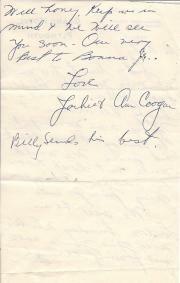 Laid down on leaf removed from autograph album. Good, on shiny photographic paper, with margin making dimensions of image 12.5 x 8 cm, captioned at foot 'JOHN STUART' and, in smaller type, 'PHOTO BY | L. PROTHEROE'. Stuart's inscription, in bottom right-hand corner, reads 'Best wishes | Sincerely yours | John Stuart'. Stuart's two Hitchcock films were the director's debut 'The Pleasure Gardens' (1925), and 'Number Seventeen' (1932). Signed Autograph Inscription by the English cinema actor Peter Haddon. On leaf removed from autograph album, with one set of rounded corners. In good condition. Reads ' Good Morning - Bill! | With every good wish | Yours Sincerely | Peter Haddon | 1928 -'. Together with a loose newspaper cutting carrying a photographic portrait. 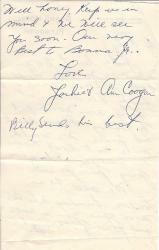 Autograph Letter Signed ('Jackie & Ann Coogan') by Hollywood actor Jackie Coogan to the variety entertainer Rubye Colleano. Undated [c. 1947?]. On letterhead of the Grand Hotel, Plymouth. 12mo, 2 pp. 19 lines of text. Clear and complete. Fair, on lightly-aged paper. Begins 'Just a line to tell you we miss you like mad & hope you are well & happy. Praises a 'dinner at Mary's'. They hope to call on Colleano when passing through London on 'Sunday Nite'. 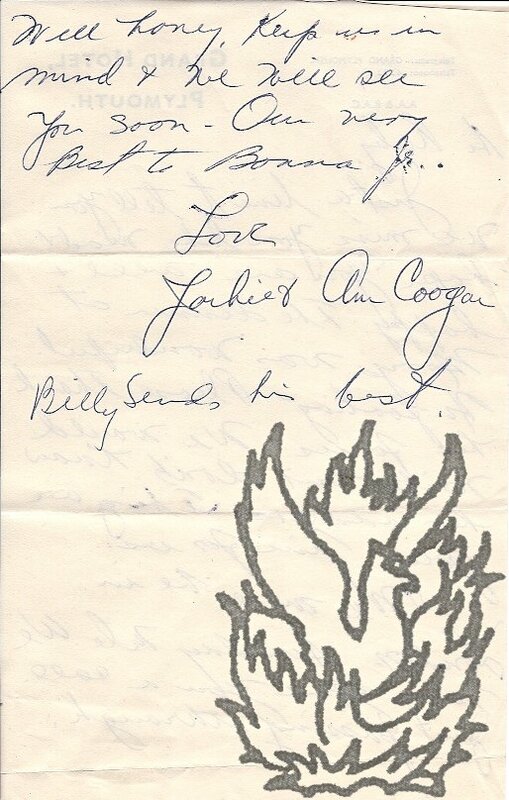 Ends 'Well honey, keep us in mind & we will see you soon - Our very best to Bonar Jr. [Colleano's son the film actor Bonar Colleano]' Postscript 'Billy sends his best'. Coogan was married to Ann McCormack, his third wife, from 1946 to 1951. From the Colleano Family archive. 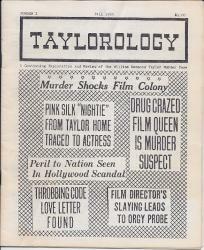 Typed Letter Signed by Bruce Long, concerning the William Desmond Taylor murder case, together with the first issue of Long's pamphlet 'Taylorology'. Letter: 10 January 1986; Mesa, Arizona. Pamphlet: Number 1, Fall 1985. Letter: 4to, 1 p. Twenty-six lines. Text clear and complete. On aged and worn paper, with a couple of holes, light staining and indentations. 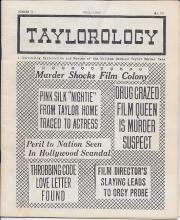 Addressed to 'Jon', whose book, with a 'chapter pertaining to the Taylor case' Long 'would like very much to see'. 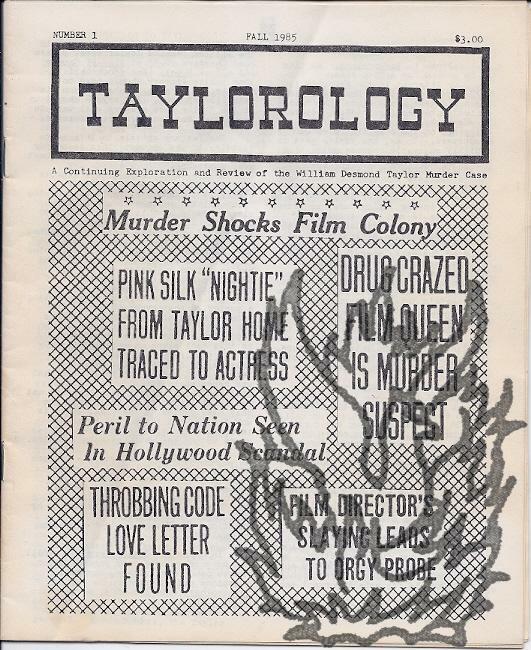 Long encloses the copy of 'Taylorology', of which he writes, 'Despite my intentions, there was only one issue due to very poor response -- only a dozen subscribers.' He boasts that his 'collected material on this case', 'primarily newspaper clippings', 'weighs over 30 lbs., with more information coming in every week'. Without date or place, but docketed '1925'. Movie cowboy (1880-1940) whose real name was Thomas Hezekiah Mix. Dimensions approximately 2 inches by 3 inches, with the signature 'Tom Mix,' in blue ink and approximately 1 1/2 inches long. In good condition although the 'om' of 'Tom' slightly smudged, and with a small brown stain above the tip of the 'T'. Mounted on an irregularly-shaped piece of blue card, docketed '93 | Famous Cinema Star | noted particularly for His wonderful riding and His famous horse Tony'.